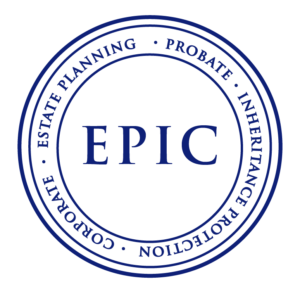 If you would like to work with us after getting to know the firm through our email newsletter or one of our free workshops, the next step is scheduling your EPIC Protection Planning Session. During the Session, we guide you through the probate process, so you know exactly what would happen to everyone you love if something happened to you or your spouse. We will also help you organize your assets so you can relax and know what you have and the exact protections you need. Step 1: Call (770) 933-9009 and schedule your EPIC Protection Planning Session. This will usually be set for 2-3 weeks after you contact us. Step 2: Return your Personal Information Questionnaire — Once your appointment is scheduled, we will send you a package of information that will help you begin the process of getting your legal and financial life in order. The Session is a real working meeting and the questionnaire that is included in the packet is extremely important because it provides us with the information we need to provide you with maximum value during the Session. Once you’ve completed the questionnaire, please return it to us by email or fax at least 48 hours before your scheduled meeting date. During this Session, you will meet with Attorney Amber Brantley to discuss how each of your assets would be passed on to your loved ones. We will flag any concerns and provide solutions to any unexpected costs, consequences, and or time caused by the probate process. We will also discuss each of your loved ones and look at how to make things as easy as possible for your loved ones after you are gone. Our goal for the Session is to identify the best ways for you to ensure your legacy of love and financial security for your family. By the end of the meeting, you should understand your planning options, what they will cost and whether Brian M. Douglas & Associates, LLC is the right firm for you. If you choose to plan with us, we may complete the design of your plan at your Session if we have time. If not, we will schedule a follow-up design meeting. If we decide that we are not a great fit, that’s okay! We are happy to refer you to an attorney who fits your needs.